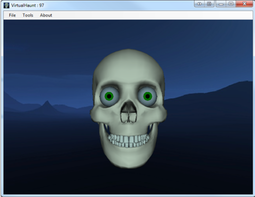 Simulate 3-Axis Skull(s) in a 3D environment right on your PC. Please be sure to download the 10 day trial FIRST and confirm that it works on your system and give you the results you expect before you purchase it. This is why the trial period exists. Note: You will receive a Key Code via email within 3 business hours after payment is received. Copyright 2015 Nelson Bairos. All rights reserved.